Xtrada 5 is designed with the best components in its class. Produce smoother rolling resistance, with a modern design. Xtrada 5 comes with a lightweight hydroformed alutech frame, with a 120mm suspension fork (with hydraulic lockout) for better bike control overcoming all terrain at high speed. 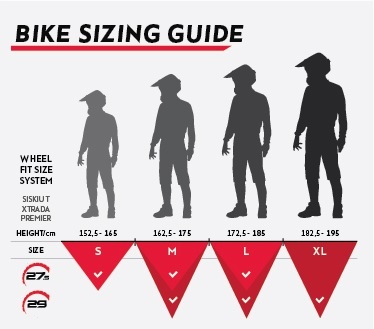 Xtrada 5 comes with a Wheel Fit Size System, where the wheel size is calculated specifically following the bike frame size and the user for optimal efficiency. Comes with a choice of sized frames S, M, L with wheels measuring 27.5 "and frame size M, L, XL with wheels measuring 29". Xtrada 5 is the perfect partner for a delightful mountain biking experience. Frames have evolved with the advancement of building materials and components. With these advancements, riders are having more confident riding, steeper, and more technical trails. FWG frame geometry has been adjusted to be more suitable to a more aggressive riding style, top tubes have become longer and seat tubes have become shorter.